1960s | No Chic. Just Geek. When I was a student, many years ago, one of the things that people did on a Saturday night was go to the weekly midnight screening of Quentin Tarantino’s Reservoir Dogs. It became almost like a regular event for many of us – once every couple of months, we would go out for a few drinks and then turn up at the Odeon in Hull just as the normal screenings were letting out. At one point, as if to emphasise the slightly cultish nature of the event, there was something of a vogue for wearing the suits and dark glasses. This went on for literally years, to the point at which the actual prints of the film started wearing out. The film was originally released in the UK at the beginning of 1993 and was still enjoying this odd afterlife two or three years later, even occasionally resurfacing for a more conventional run. This was mostly due to the unique circumstances of this film, which was banned on video in the UK for most of this time, but such a long cinema run is still unusual. 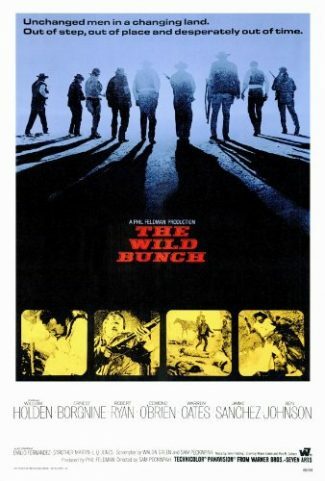 However, when it comes to violent ultra-masculine action thrillers that enjoyed unusually protracted UK cinema visits, then the film for you is undoubtedly Sam Peckinpah’s 1969 film The Wild Bunch, which ran in one London picture house for seven years. The movie opens with a group of men in US Army uniform riding into a small town in southern Texas. The year is not specified but one can infer it is around 1913. As the group arrive at a railroad office, it soon becomes apparent they are not soldiers but thieves, led by the ruthless outlaw Pike (William Holden), along with his lieutenant Dutch (Ernest Borgnine). But the gang’s plan to rob the railroad payroll seems to be going awry, for their appearance has been anticipated: lying in wait for them on top of the building across the way are a motley group of bounty hunters, led by Thornton (Robert Ryan) – a former associate of Pike’s who has been offered early release from prison in exchange for his assistance in hunting down his former friend. After a long, tense build-up, the thieves attempt to make their escape, and a full-scale gun battle erupts between them and the bounty hunters, with many members of the local town caught in the crossfire and casually gunned down. Pike, Dutch, and several of the other gang members manage to shoot their way out of town and escape, leaving ugly scenes in their wake as the hunters squabble over the spoils and pick over the corpses. 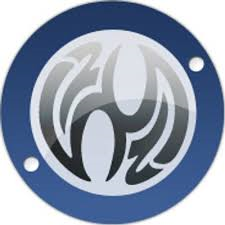 However, Pike and the gang are disgusted to discover the silver they planned to steal has been replaced by steel washers, and Pike’s authority over the group is challenged. He manages to hold them together and they head down into Mexico to plan their next movie. Pike is aware that time is running out for men like them, and maybe the chaotic situation south of the border will throw up some opportunities. So it initially proves, as a tenuous deal is struck with a corrupt general, to steal arms for him from the US government. But Thornton and his posse have not given up, and a member of the gang has his own reasons for opposing the general. Pike and the others find themselves having to choose between personal loyalty, and self-interest. The Wild Bunch showed up at the UPP in Oxford recently as the finale of their classic western strand – an entirely appropriate choice, given it is generally accepted to be one of the last of the truly great western movies. Showing just the previous week was Butch Cassidy and the Sundance Kid, which I went to see with a friend – she thoroughly enjoyed it and asked if there were any other ‘cowboy films’ coming on. I said yes, but probably should have made it clear that this was a slightly different kind of film in its tone and outlook. That said, Butch Cassidy and the Sundance Kid and The Wild Bunch have much more in common than you might initially think, even considering they’re both westerns (and thus naturally share a kind of generic resemblance). Both films are essentially concerned with the death of the old west, as it is generally conceived, and feature characters who are increasingly aware that the world around them is changing. Pike and his comrades see automobiles and machine-guns starting to appear around them; there is even talk of aeroplanes. There are a number of images and plot elements shared by both films as well – the pursuit of the main characters by hired killers (although in this case the leader of the posse is a more complex, sympathetic figure), the flight from the USA to another country, the climactic, bloody encounter with the army. Nevertheless, this is a textbook example of how two films in the same genre can take similar material and produce totally different results. Writing about Butch Cassidy and the Sundance Kid recently, I said that there’s a sense in which it almost doesn’t feel quite like a western at all – it’s a charming, romantic film that includes a lot of western iconography, but the focus is wholly on the central trio rather than the milieu in which they live. The Wild Bunch almost feels like a riposte to the other movie, an attempt to set the record straight – the real-life Sundance Kid was actually part of a gang known as the Wild Bunch, who were far from the inoffensive rogues beloved of most Hollywood depictions. If there is any romanticism in this movie, it is of a very hard-edged kind. Pike, Dutch and the others are visibly ageing, grizzled and weather-beaten by their hard lives – Pike is half-crippled by an old wound, for instance. Charming they are not. Unlike Redford and Newman, this gang are ruthless killers when the situation demands it, showing little remorse for their actions – Pike has no qualms about finishing off one member of the gang who is too badly wounded to accompany them in their escape. You might therefore wonder how they can have any demand on the audience’s sympathy – shouldn’t everyone just be rooting for Thornton all the way through? Well, Thornton himself comes across as an ambivalent, conflicted figure throughout, disgusted by the trash and scum he’s been given to lead. ‘What kind of man are we after?’ asks one of the bounty hunters, referring to Pike. ‘The best,’ Thornton curtly responds. Ryan’s performance makes it clear that Thornton hates himself for going after his former friend, and is only doing it to escape prison and the accompanying torture. Through his regard for Pike, we gain some ourselves. And there is, of course, the fact that while the gang themselves may be crude, violent, ruthless men, Peckinpah still surrounds them with other characters who are appreciably worse. They live by some kind of code of honour, look out for each other, respect each other as men. And as the film goes on and we share in their small victories and the accompanying camaraderie, we do come to respect and care about them ourselves, even though they are obviously doomed. When that doom eventually arrives, it is in the extraordinary climax of the film. Watching it again, you can’t help wondering about the extent to which Peckinpah is suggesting that these men are knowingly going to their deaths, opting to go out guns blazing. Is this really about their personal code of loyalty, or just a convenient pretext to cover a breathtaking outburst of nihilistic violence? At one point there’s a temporary lull in the slaughter and it looks like the gang may be able to get away with their lives – but Pike seems to make a deliberate choice to provoke a further surge of killing, this one uncontrollable. The director keeps it ambiguous. What is certain is that the Wild Bunch don’t get the gentle, sepia-toned freeze-frame-and-pull-back accorded to Butch and Sundance: they die bloody, in full view of the camera, but by no means alone. You could probably argue that the final battle of The Wild Bunch was the shot heard round the world, in terms of finally extinguishing whatever innocence the western had left once Sergio Leone had his hands on it (well, more like several hundred shots heard round the world). Even today it is a remarkably intense nearly-five-minute sequence, a crescendo of blood as everyone involved seems to lose their reason and becomes fixated on killing anything that moves. The result is a kind of reflexive spasm of violence, made unforgettable by Peckinpah’s use of fast cutting, slow motion, and large quantities of blood squibs. Apparently the director’s intention was to shock the audience and confront them with the realities of violence, and he was concerned that viewers actually found it cathartic. Even today it is hard to decide which is really the case. This kind of careful ambiguity extends through the movie, affecting how we view the characters’ motivations and identities. The result is a kind of studied amorality, which – when combined with the staggeringly violent sequences that bookend the film – could make it possible to dismiss the film as something technically competent, but with little to say for itself. I think this would be to do it a disservice. One of Peckinpah’s more striking choices is the sheer number of cutaways to women and children observing the main action of the film. They are there watching the gang ride in, they are present at the various villages they visit, they are taking cover during the final massacre, and so on. It looks like Peckinpah is making a point about the contrast between the men who are his main characters and the innocent lives damaged by their violence – but are they really so innocent? The playing children watching the gang’s arrival turn out to be torturing animals, while in the midst of the final battle, Pike is shot twice: first by a woman, then by a child. Whether you interpret this as representing masculine violence contaminating everyone exposed to it, or simply a sign that there is really no such thing as innocence, it suggests that Peckinpah did have moral ideas he wanted to express – just not very comforting ones. Of course, you can interpret The Wild Bunch in terms of its presentation of violence and moral theme, or simply enjoy it as a terrific, hard-edged western. It has the epic scenery and rousing soundtrack you would expect of the best of the genre, and it really is about the classic themes of the genre – what it means to live as a man, in this particular setting. It’s still a challenging film to watch, but a challenge which it’s well worth meeting. Once more unto the Ultimate Picture Palace (if this keeps up I shall have to consider buying yet another cinema membership card), where they are currently showing a season of classic westerns (and why not). To be honest with you, the collection of films on offer is a bit of a mixed bag – they have The Searchers, The Good, the Bad and the Ugly, and The Wild Bunch, which obviously all qualify, but also Rio Bravo – I mean, it’s okay, but I prefer the John Carpenter semi-remake – and The Last Movie, which in addition to being fairly obscure also features in a book entitled The Fifty Worst Films of All Time. Also on the list is George Roy Hill’s 1969 film Butch Cassidy and the Sundance Kid – now, this I would say was an indisputably classic movie, one of my personal favourites, but a classic western? On paper it looks like a fairly standard example of the genre. The film is set, we are invited to infer, in the very last years of the 19th century, with the charming and ingenious Butch (Paul Newman) and the taciturn but deadly Kid (Robert Redford) well-established as outlaw robbers of banks and trains, and happily ensconced in a not-quite-love-triangle with schoolteacher Etta Place (Katharine Ross). They are local celebrities, sort of, generally trying to avoid hurting people in the pursuit of their activities. The sun shines, the scenery is beautiful; Butch and Sundance barely seem to have a care in the world. Well, it’s always a pleasure to see a film like this back on the big screen, especially given the thick-headed TV edit currently in circulation. It’s actually a little discombobulating to realise that Butch Cassidy and the Sundance Kid is celebrating its fiftieth anniversary this year, for it feels as fresh and engaging as it ever did (I guess it must: the UPP is also currently showing The Old Man and the Gun, in which a rather more grizzled Redford bids his adieu to the screen playing a role not a million miles away from the Sundance Kid). 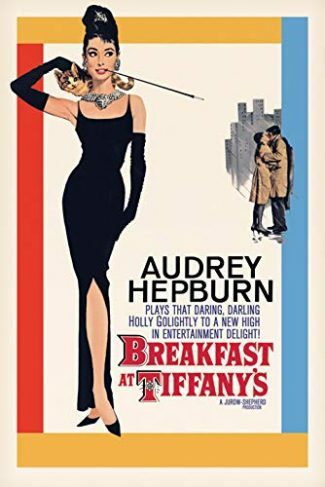 I first saw this film at a very early age and have lost count of the number of times I’ve seen it since; my appreciation for it has done nothing but grow, and it is on the list of those films which seem to me to be virtually perfect. But is it strictly speaking a classic western? It might sound like an absurd question. I suppose it boils down to how you define the western as a genre – if you consider it to be any film predominantly set on the American frontier in the nineteenth century, then naturally it qualifies. Some people would be more rigorous and suggest that a classic western must deal with themes of honour, loyalty, individualism, perhaps even rugged masculinity. These are the same people inclined to dismiss Sergio Leone’s films as superficial nihilism, for all their critical and commercial success. 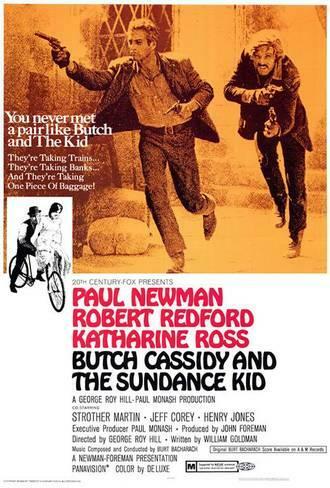 Certainly you could argue that Butch Cassidy and the Sundance Kid often feels much more like a comedy-drama buddy movie, as the title duo banter and squabble their way through the movie; part of its charm is that it is genuinely and consistently funny throughout. The soundtrack, provided by Burt Bacharach, is also hardly the stuff of a classic cowboy movie. 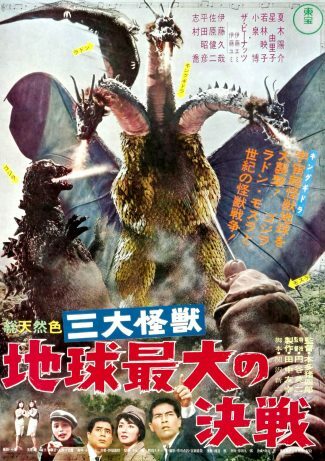 Real purists might also take issue with the fact that the closing stretch of the film is set in South America, and the film did apparently struggle to get financed for a while as studio bosses objected to the fact that the heroes essentially spend much of the movie running away (‘John Wayne don’t run away,’ was the comment of one executive). I think this is to miss the point of the film, which is essentially about the classic cowboy in retreat. It is, obviously, a deeply nostalgic film – there’s probably an interesting discussion to be had about the place of nostalgia within the western genre – fully aware of a world slipping away. The appearance of modern bank vaults and bicycles in the old west are just signs that things are changing on a deeper level, and there is no place for outlaws any more. The film is about the death of this romantic world, and due to the sheer charisma of Redford and Newman, you feel its loss keenly no matter how irrational this is. One of the most impressive things about William Goldman’s script is the way in which the tone of the film gradually but imperceptibly grows darker as it progresses – Butch and Sundance are never short of a wisecrack or put-down, even in the midst of their final encounter with the Bolivian army, but their exploits become progressively grittier and more violent as the film approaches its end. As bandits, they are presented as committing almost victimless crimes – it is their attempt at going straight that leads to them becoming killers. You could probably view the whole movie as a metaphor for the western genre’s loss of innocence – it opens with footage from a silent movie from the genre, and grows progressively darker and more ‘realistic’, as I’ve mentioned. The bodies of the Bolivian bandits killed by the duo tumble in slow motion very much like something from a Sam Peckinpah film, which the film in some ways begins to resemble. Is it stretching a point to suggest that, by killing off the lead characters at the end, this film is an example of the western anticipating its own imminent demise, in its traditional form at least? We should also perhaps remember that this film came out in 1969, and there are surely echoes of the sunlit days of the summer of love in the film’s lighter moments. Butch and Sundance are obviously anti-establishment figures, not actively seeking to harm anyone, just to carry on the relatively carefree existence they enjoy – they are rogues rather than villains. Perhaps by the very end of the 60s it was already becoming apparent that the dreams of the counter-culture were part of a world as doomed to pass as that of the two outlaws, and this is why young audiences responded so strongly to the bittersweet mood of the film and the poignancy of its conclusion: we are spared the gory details, left with an image of our heroes frozen in a sepia-toned past, drifting off into the distance. This film is a joy, while never forgetting that all things must pass – but so far, at least, Butch Cassidy and the Sundance Kid itself seems to be timeless. You have to love a line of dialogue like that. In fact, if I had come across it in one of those lists of great movie quotes, I like to think I would at once have started actively seeking out the movie from which it came. In this case, the line comes from the 1964 movie Unearthly Stranger, directed by John Krish. 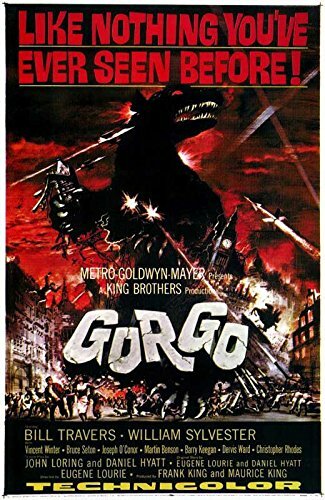 This is supposedly a highly-meritorious British B-movie, but the fact that I’d never heard of it until only a few days ago rather suggests to me it is in fact fairly obscure, as these things go. Still, now I know if it, I have seen it, and if my mind has not been blown then it has certainly been breathed upon quite energetically. The story gets underway with our hero, Mark Davidson (John Neville), running across London at night, clearly in a bit of a tizzy. There is a lot of running. One might even say there is an inordinate amount of running, especially when you consider this film is well shy of 90 minutes in length. I might even be moved to suggest that the script for the rest of the film had yet to be finished when they started filming, and so they just kept Neville running as a means of filling the time. Well, anyway, our man eventually arrives at his workplace, the Royal Society for Space Boffinry, where he sits down with a reel-to-reel tape recorder to narrate the rest of the movie, which happens in flashback (it’s a well-worn old device, but it has a certain charm). Well, it seems that the space boffins are hard at work coming up with a method of interstellar travel through means of willpower alone. This depends upon coming up with a formula to unlock the hidden potential of the human brain, also known as TP-91 (not that any of the details sound remotely convincing or have any particular bearing on the plot). It transpires that Davidson’s old boss, Professor Munro (Warren Mitchell), worked out part of the solution before retiring to his office – only to be discovered dead a few moments later! ‘It was as though there was an explosion inside his brain,’ reports the project’s security officer, Clarke (Patrick Newell). Davidson, who was away on holiday in Switzerland at the time, is the new boss, and Clarke fills him in on some disquieting details – parallel projects into brain-powered space travel are underway in America and the USSR, but they too have been hampered by the mysterious deaths of key researchers, all of them with the same symptoms of exploding brains. Cripes! Could foul play be afoot? Davidson lets himself get a bit paranoid and the film heads off down some curious blind alleys for a bit – Munro’s body has disappeared, and it seems there were traces in his body of a poison only otherwise found in returning space capsules – before settling on the more fruitful topic of Davidson’s relationship with his new wife Julie (Gabriella Licudi), whom he met during his recent holiday. ‘Is your wife an alien?’ puffs Clarke (meaning, not British) before embarking on the usual security checks. Normally this would count as unforgivably obvious writing, but in a film like this one it’s all par for the course. Soon enough Davidson is unsettled to discover his wife sleeps with her eyes open and has no pulse, while his colleague Professor Lancaster (Philip Stone) spots her taking the casserole out of the oven without using gloves. Yes, there’s something about Julie, and it comes as no surprise when she fails her security check on account of not actually having existed until a few weeks ago. By this point the audience has already enjoyed a schlocky-but-eerie sequence in which she wanders down the high street, upsetting small babies with her subliminally extra-terrestrial presence, scaring off whole crowds of schoolchildren, and so on. However, she is a sensitive soul and this moves her to tears: the tears appear to burn the skin of her face, in a nicely bizarre touch. But what is her mission here on Earth? And could her burgeoning feelings for her new husband get in the way…? As you may have gathered, with Unearthly Stranger we are in the realm of the dingbat pastiche of either Quatermass or Village of the Damned, but it’s still oddly watchable stuff. The film-makers get top marks for managing to make a proper science fiction film without the need to include any special effects at all (always a neat trick), while for a modern audience the film’s casting certainly has cult credibility: these days Neville is best remembered for playing the title role in Terry Gilliam’s Baron Munchausen as well as the Well-Manicured Man in The X Files, while Philip Stone was Jack Nicholson’s predecessor in The Shining, and Patrick Newell was Mother in the final season of The Avengers. Jean Marsh, an actress whose genre pedigree stretches from the original Twilight Zone to Mark Gatiss’ Crooked House, also appears in a small but crucial role. (Warren Mitchell manages to land fifth billing despite being in only one scene.) All of these actors, by the way, uphold the proud British tradition of doing your best even when you’re saddled with some rather dodgy material. I am tempted to say that once you get past the deeply suspect premise of scientists seriously engaged upon research into some form of psychic teleportation, this is not too bad, as paranoid SF B-movies go. However, watching it today what strikes you again and again is the sense that this film was made exclusively by, about, and for white men in their late thirties: even though the film appears to be about the alien infiltration of Earth society by the main female character (shades of Under the Skin), Julie almost always feels like the object of other characters’ activity and attention rather than someone with any real agency. And it is telling that she feels like not so much an alien disguised as a woman as an alien disguised as a housewife – note how she is rumbled by her peculiar behaviour when getting dinner out of the oven. Of course, there is a degree of irony involved here – Neville’s sneering dismissal of what he sees as the superstitious nature of another character is setting up the climactic twist of the film – but in the end the gender politics of Unearthly Stranger, perhaps its most striking element beyond the weirdness of its SF plot, are just a bit too odd and uncomfortable for a modern viewer. The fact that it is hardly flattering, in the end, to its male characters doesn’t entirely make up for the fact that it seems perilously close to misogyny in its presentation of women. Then again, the film hasn’t exactly aged well in any other respect, so it’s not a tremendous surprise that this aspect is problematic too. Nevertheless, it’s an interesting little film if you like this sort of thing.